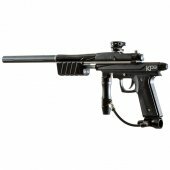 Pump Paintball Guns There is 1 product. Due to the consistent firing mechanisms in pump paintball guns, you will have the ability for precise targeting with every shot. With the Hammer 7 not only do you have the features of a consistent pump paintball gun, you can also choose between using a magazine or hopper loading system. The Empire resurrection pump gun offers a closed bolt firing design that offers the most accurate shot. Be more accurate and conserved than your opponent with a pump paintball marker.